If you have a bilingual population who constantly disturb you at home or business, this No Soliciting No Solicitar Sign covers both English & Spanish speaking solicitors. Fire Riser Room Icon Acrylic Print Sign - 3" x 10"
Keep unwanted visitors away from your property or business with this 12” x 18” No Soliciting No Solicitar Dual Language Aluminum Sign. These signs are printed on vinyl and mounted to heavy duty aluminum. Two pre-drilled holes are at the top & bottom for easy installation. Aluminum has 1.5” radius corners to protect you from sharp edges and gives a professional finished appearance. For longer life of your printed sign, add lamination for a few dollars more. Lamination helps protect from UV rays to extend the life of your signs and is recommended for outdoor signage. For roofed parking garages, the vinyl print & aluminum will last for several years without lamination with no sun exposure. 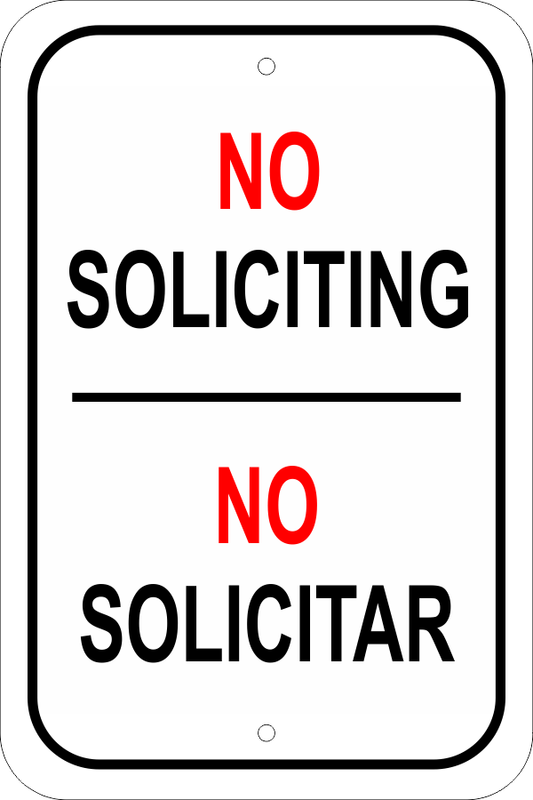 Order your No Soliciting No Solicitar Dual Language Aluminum Signs today. Most orders ship the next day!